ACON Rectangle Trampoline - Acon Air 16 Sport HD Review! ACON, manufacturer with Finnish know-how and years of experience in manufacturing trampolines and similar equipment presented a newcomer in trampoline world. This trampoline is their newest attempt to assimilate the world of rectangle shaped trampolines. 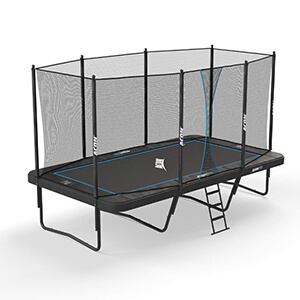 As trampoline market lacks good rectangular trampolines, looks like ACON decided to put an end on it and make one great trampoline, capable of much more than fellow competitor products. Design is perhaps the weakest point of the trampoline, so it’s best to get this out of the way. 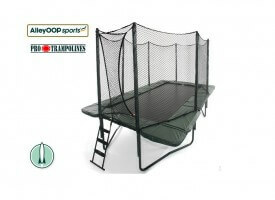 The trampoline looks very subdued with its olive green color and black mat. While certainly not inconspicuous due to its sheer size, we feel it should have been designed in a bit more exciting way. Some might like the no-nonsense style though. It definitely is a nice change of color, at least for us, as most trampolines come in a generic blue color. With this trampoline, it’s definitely function over form all the way – the Finnish way, as we like to joke. 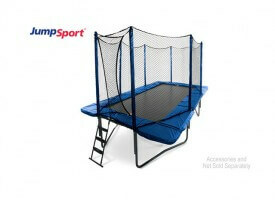 Note: Trampoline enclosure for ACON Sport trampoline is INCLUDED in package. The frame in this rectangular trampoline is extremely heavy duty. The diameter of the tube measures 2.4 inches and the tube itself is 0.10 inches thick. These are very thick poles and we feel they can take on a lot of weight. The frame tubes are galvanized inside and out, thus ensuring a rust-free experience. 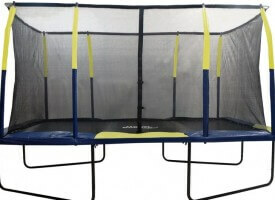 The Acon Air trampoline boasts an impressive number of springs – 140 pieces of heavy gauge springs! A They are all galvanized to avoid rust and are 10 inches long. This all works out to give a bounce that is simply out of this world. The trampoline is extremely responsive and you can bounce very high with little effort. You can basically jump as high as you want, but take care not to jump over the enclosure! :) Springs itslef have a spring preload of 82 N.
Now this is where the real fun starts. 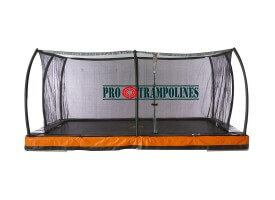 The trampoline measures 17 x 10 ft. and the jumping mat is about 15 x 8 ft. large. This means there is 120 sq. ft. of jumping surface! 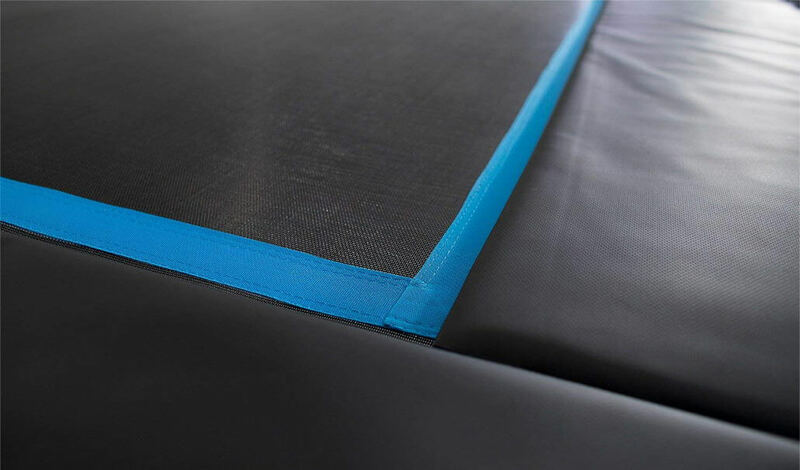 The polypropylene mat itself is six times cross sewed for extra durability and is covered with UV resistant coating. The trampoline stands at 40 inches from the ground. The enclosure is an another very impressive part of the trampoline. 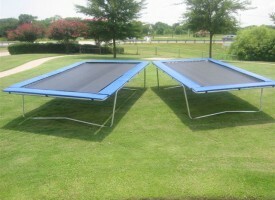 It is 7.3 ft. high when measured from the mat, giving the trampoline a total height of over 10.5 feet. A total of eight poles are each 0.08 inches thick and measure 1.7 inches in diameter. They too are galvanized both inside and out. The safety net is absolutely fantastic. It fits tight and the polyester material used is very strong. It is definitely fit for the purpose. There are special doors you use to get on and off the trampoline. Of course, you can leave it on all the time, as the net is UV resistant and should not degrade over time. Time will show if we’re right, but it just seems so sturdy and well-built that it should last a long while. For maximum safety, the poles are covered with thick foam with a layer of vinyl that helps absorb the forces of impact, should you misjudge a jump. The poles are solid and have little give. The safety pad is 1.2 inches thick and covered in UV resistant vinyl. It’s 13.8 inches wide so that it covers the whole length of the springs. There have been thicker pads that we’ve seen, but this one if perfectly adequate. The material is of better quality than most other pads. 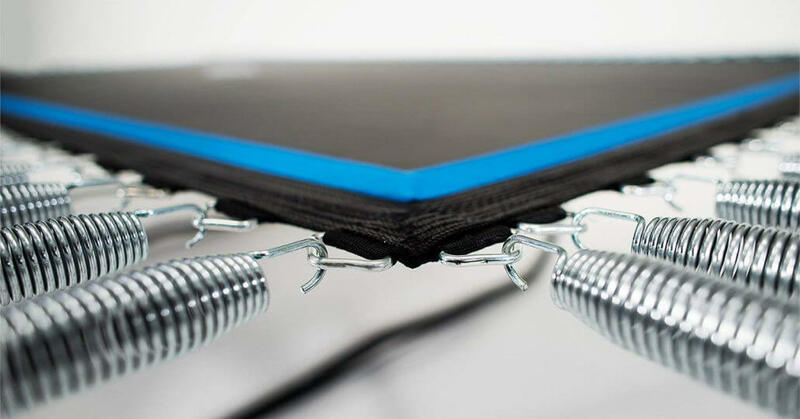 It does sit above the springs so even if you land on the mat, it is still bouncy enough. The whole deal is heavy duty and you can leave it outside year-round. The trampoline can definitely withstand the elements – it is sturdy and bulky, but everything just fits into place and it feels extremely safe. The warranty on the frame and mat is 5 years. While we’ve seen warranties on the frame of 10 years or more, this is less important as the frame is not expected to fail anyway. But the 5-year warranty on the mat is phenomenal. The enclosure and net have a more standard warranty of 1 year. The customer service is very good and will do their best to answer your questions. The trampoline comes in three boxes plus the enclosure and the assembly takes a few hours. The instructions are very good and clear, but since the trampoline is so large, be prepared to spend some time putting it together. It comes with a spring pullet tool for easy installation of the springs. Beware though, assemble it on the spot where you want the trampoline to be, as it is bulky. It weights 420 lbs. (over 500 lbs. with the enclosure) and it’s heavy to move around. 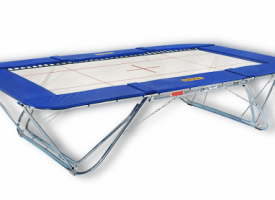 Conclusion; Our thoughts about Acon Air 16 Sports HD rectangletrampoline! What is there to say? If you are looking for a great quality rectangular trampoline but don’t mind paying the price for it, then this is definitely the choice for you. Such build quality is rarely seen and the warranty on the mat – the part most likely to break – is outstanding. The whole trampoline is sturdy and the fact that the manufacturer hasn’t specified a maximum weight speaks of its brilliance. Not that more than one person should bounce on the trampoline, but even four people would be hard pressed to overload it. The bounce is excellent and the enclosure provides enough safety for the regular user. Some might like its understated, conservative design. This model, design in Finland, is what a quality trampoline should be like. The only problem – you better be ready to shell out serious amount of cash. This is not a downside though; many trampolines of this size can cost even more, and with this one you do get what you pay for. The Acon Air 16 HD Sport Trampoline features great build quality, excellent bounce with 140 springs and a huge jumping surface that is UV resistant. 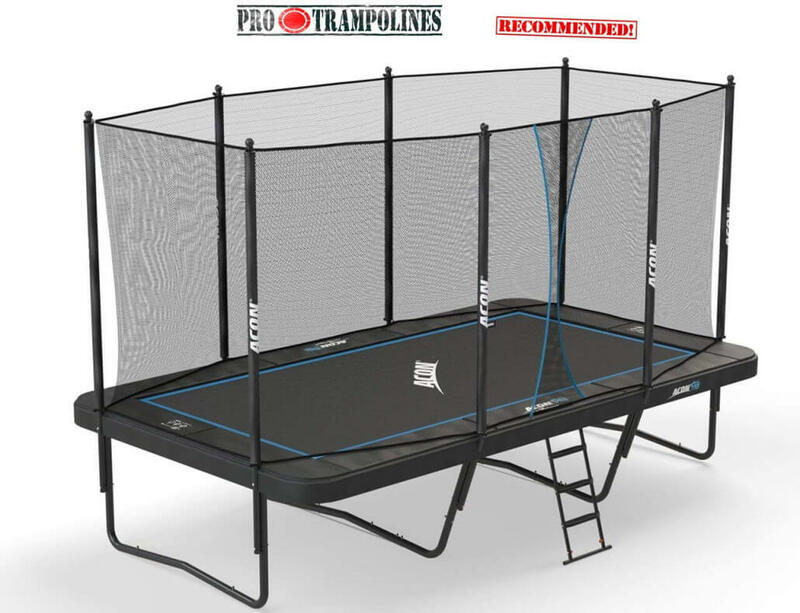 Excellent trampoline that represents great value and quality when compared to its rivals.